On behalf of the Public Generating Pool (PGP), a group of hydro-owning public power entities in Washington and Oregon, E3 completed a study exploring the effectiveness of a range of policy mechanisms to decarbonize the electric sector. This study used RESOLVE, E3’s optimal capacity expansion model, to develop optimized generation portfolios for the region through 2050 that capture the unique characteristics of the Northwest hydro system. 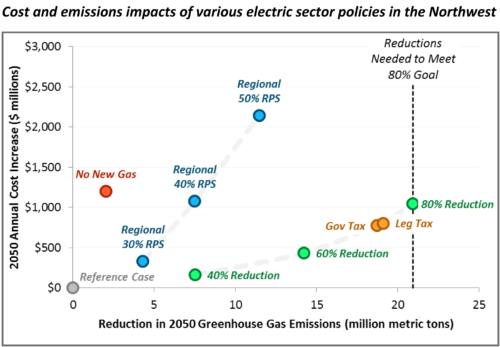 Scenario analysis was used to examine the cost and emissions impacts of a variety of policy mechanisms, including: (1) regional carbon cap & trade; (2) regional carbon tax; (3) increased regional Renewables Portfolio Standard; and (4) a prohibition of new gas generation. The modeling results indicate that decarbonizing the electric sector in the Northwest can be achieved at relatively low cost with a policy that focuses directly on carbon reductions, whereas policies with an indirect focus on emissions reductions generally achieve less reduction, result in higher costs to ratepayers, and can introduce distortions into electricity markets with unintended consequences. The Northwest’s existing fleet of zero-carbon hydro and nuclear resources play a crucial role in enabling decarbonization at a low cost—meeting decarbonization goals becomes significantly more challenging and costly should existing zero-carbon resources retire. The results and implications of the study have been broadly shared with key stakeholders and government officials in the electricity sector, including investor-owned utilities, public power agencies, and environmental groups. You can find the Pacific Northwest Low Carbon Scenario Analysis – Technical Report, and E3’s PowerPoint Presentation on E3’s website. E3 experts Arne Olson, Nick Schlag, Jasmine Ouyang and Kiran Chawla contributed to the study.